I read this book just about at the perfect time; after reading seven dark thrillers, mysteries, and moody fantasies, I needed something to cleanse my literary palette and get me back to 'bookish square zero'. This really was a delightful read, taking me to all the right places that I hoped a book like this would. 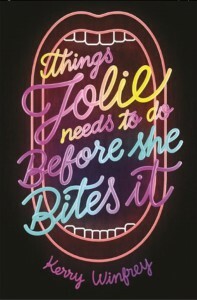 It revolves around Jolie Peterson, who is sixteen, in high school, and has an underbite, which is medical termed as 'mandibular prognathism' (I didn't even know that, and my dog has the most severe underbite; he was my motivator for requesting an early copy of this book - yes, really). Jolie has spent her entire life NOT wanting the spotlight before of her teeth, but also preparing for surgery to 'fix her face' so that she can end the headaches, chew properly, and stop feeling like she's different from everyone else. She wrestles with the questions of what makes someone beautiful, just like a lot of young people do, whether they have a misaligned jaw or not, and it takes her a long time to realize that many people worry if they're good enough, smart enough, pretty enough. While she prepares for this long-awaited surgery, so many things come up for Jolie, and it may seem like you're reading a book with all the high-school literary tropes crammed into it. But it's DONE SO WELL. She is dreading the surgery and creates a list of things she must do in case she dies under anesthesia, and these naturally include doing things like finally kissing a boy. But she also dares to try out for the school musical, and guess what, she is amazing when she auditions and she gets the lead. She also has the best of friends since kindergarten and one that happens to be a guy, Derek, and she's just now realizing he's hot. This always presents a massive problem. You may think you have read this before but the author, Kerry Winfrey, writes ALL these scenarios and these characters with so much sincerity and originality, that they are not ones that I'd met before. The male high school boys are ones with honest concern for their female counterparts. The female high schoolers are smart, and Winfrey didn't see it necessary to play the 'mean girl' card, or have Jolie really bash herself into the ground to come to her final conclusions about self-esteem and beauty (although she does a lot of natural questioning and normal comparisons). Characters acknowledge their mistakes in ways that make sense, without being preachy, and I love the tone of the writing throughout the novel because of this. I also totally enjoyed the TV obsessions of the family, and the 'Terrible Movie Night' Jolie and Derek share. This is a light and funny book, with some bigger issues like self-esteem, and dealing with grief and changing friendships within it, but it's ultimately about Jolie's chance to shine, to change, to grow. Her voice is charming and heartfelt, and the book left me in such a great place, feeling like I knew all these great people!